Crossfit requires tons of equipment, special shoes, towel, and much more. Let’s not forget about the little stuff we carry around everywhere, like keys, wallet, phone, and so on. Packing all of those things into one bag could be a major problem if it weren’t for large duffel bags! There are many features that those bags must have, to suit us. Special compartment for separating smelly shoes from the rest of our equipment, water bottle pocket, valuables pocket and much more. Finding bags specifically designed for CrossFitters (athletes generally) wasn’t easy, but we’ve narrowed down the choice to 7 gym bags. High-quality brands like Adidas, Everest, Under Armour and other brands have designed some really amazing gym bags. Make sure to check them out! First of all, here’s something about the Adidas itself. Adidas AG represents a German multinational corporation, located in Germany. They design and manufacture all kinds of accessories, shoes, and clothing. When we talk about the Europe, they represent the greatest sportswear manufacturer, and when it comes to the world, they represent the second sportswear manufacturer. This is a big deal! This information should be more than enough for you to realize that whether you question the design or the quality, Adidas has it both! The size of this Adidas Duffel bag is 12 x 22 x 12 inch, meaning that you’ll be able to put many items in it. The main compartment is pretty big, and it even has a zippered pocket in it, in which you can put your phone, headphones, or something like that. Don’t worry about your shoes or the gear that should be separated from the rest of your stuff. There’s a special freshPAK ventilated compartment, designed especially for wet or stinky clothes and shoes.For additional storage, there’s a mesh drop pocket on the opposite side of the bag. In case you need to quickly put away some of the stuff you’re holding in your hands, there’s a spacy front pocket on the bag. You can easily access it, and it even has a key fob for your car keys, home keys or something like that(feel free to make the bag look like it belongs to you). Whether you’re going to lay your bag on a gym floor or a wet field, you should know that your stuff will remain safe. The bottom of the bag is ClimaProof water resistant, so feel free to toss your bag anywhere. Also, don’t worry about the comfort of wearing it – you won’t feel it! Padded air mesh shoulder pad, shoulder strap along with wrapped handles make your bag pretty comfortable. Besides plenty of room, this gym bag also looks darn good. The Adidas brandmark with 3-stripes sign looks quite nice, and it also leaves you space for your team branding. The Everest has been designing and manufacturing all kinds of quality bags, aiming to provide reliable products for their customers. They started in 1982, and since then, their goals didn’t change too much – they’ll do anything in order to satisfy every possible customer’s need. Whether you need a backpack, multipurpose pack, travel gear, or a CrossFit gym bag, they have it all. The name Everest comes from their personal story – they are climbing to become the world’s best gear brand. And they are on a good way! Their gym bags are very promising. This Everest gym bag is 11.81 inches high,10.63 inches wide and 18 inches long. It weighs only 1.1kg (2 lbs 8 oz), so it’ll feel quite light in your hands, or on your back. This bag is not too large, but it will suit all your needs. The main compartment is very spacy, and there’s even a zippered clamshell opening. There’s a special side pocket, which you can use for your wet gear, shoes, or anything that you want to separate from the rest of your stuff. The bag also has two front zippered pouches, a side mesh pocket, and a bottle holder as well. Keep in mind that the bottle holder isn’t too big, so you probably won’t be able to put a shaker bottle in it, but sports bottles will fit just fine. The bag is made out of 600d Polyester, and it has an adjustable padded shoulder strap. We assure you that you’ll enjoy using and wearing this gym bag anywhere, especially for CrossFit and other kinds of sports activities. The ABD ATHLETE is a company which manufactures protective apparel and sports compression for better performance and recovery. Since their goal is to help you by protecting your body, and fastening your recoveries, there shouldn’t be any doubts about the quality of their products. 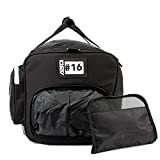 Knowing that they are doing everything they can in order to provide ways of protection, you can rest assured that even their gym bags will be comfortable. Also, don’t worry about your stuff inside the bag, they’ll remain safe as well as your back. This bag is made out of 1200D Ballistic Nylon Shell, and its dimensions are 24inch x 13inch x 14 inch. Being this big, along with having seven storage compartments, this bag will suit all your needs. Anything you ever wish to take with yourself for CrossFit can perfectly fit into this bag. We know how people usually act over-protective about their new stuff, but you shouldn’t worry too much about this bag. Whether you drop it on a gym floor, or any wet surface, don’t worry. The bag has flat, weatherproof bottom, so anything you put inside it will remain safe. Your stuff won’t just remain weatherproof. If you’ve packed any snacks or drinks to take after the training, there’s a cooler compartment with plenty of space, and the durability is provided as well. 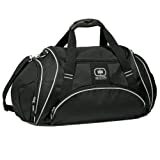 Besides great look, this ABD Athlete gym bag also provides great comfort and plenty of space. We highly recommend this gym bag for CrossFit and similar sports! Having seven storage compartments, this gym bag can perfectly help you in case you have stinky shoes or any gear that should be separated from the rest of your stuff. The bottom of the bag also has strong rubber square on each corner. There’s a great way to personalize this gym bag. There’s a removable end panel, where you can place your name, or your team logo. Besides your logo, you can personalize this bag even more, as there is a rubber placeholder as well. The OGIO started their business in 1987, and they are located in the Utah. Their unique, quality bags and apparels are meant for anyone who’s into the sports. From golfing, running, cycling, through many other adrenaline-raising sports, to the CrossFit, this gym bag will do perfectly for you. OGIO products are designed in order to carry your passion. This Crunch Duffel bag is 13 inch high, 24inch wide and 12 inch deep. For the ones who like or need to bring many items with them (redundant or relevant, not our business), this bag will fit perfectly. There’s a large U-shaped opening which you can easily access, whether your hands are busy or not. While your towel, gym clothes and so on, can fit into the main compartment, there’s a specialized shoe compartment, so you don’t have to keep your smelly shoes along with the rest of your stuff. For additional accessories and toiletries, there’s another zippered end pocket. We are aware how hard is keeping your keys, your phone, your wallet and stuff like that somewhere close. With this bag, you won’t have to worry about losing the small items. There’s a zippered side pocket for your valuables, and you’ll find it very useful. For carrying your gym bag around in your hands, there’s a plastic molded interlocking handle which you’ll like for sure. It’s quite handy, and don’t worry about the strap – it won’t get in your way while carrying the bag by its handle. However, you can take your gym bag on your back, with the padded shoulder strap. This strap is also adjustable which really comes in handy, and you can even completely remove it and just use the handle if you prefer it that way. Generally, this is a good looking bag which will suit all of your needs. We’ve already mentioned that the Adidas represents the number one sportswear manufacturer in Europe, and the second in the world. Redundant or not, we still feel the need to remind you of the uniqueness and the quality that Adidas provides through its products. 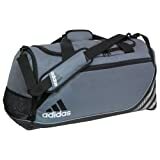 This amazing Adidas gym bag’s dimensions are 14 x 25 x 13 inches. As you can see by its dimensions, it’s pretty big, and the large compartment will help you pack a lot of your equipment. In case you need to separate some of your gear, or dirty, smelly shoes, from the rest of your equipment, there’s a freshPAK ventilated compartment. In case you have any additional items to pack, there’s a zippered end cap pocket, on the other side of the bag. For your wallet, phone, and other valuables, there’s an interior zippered pocket within the main compartment. Besides your valuables, you’ll often find yourself in a situation where you need to quickly put away some of the stuff you’re holding in your hands. The easy-accessible front pocket has plenty of room in it, and there’s even the key fob. Another great thing with this Team Speed Duffel bag is that you won’t have to worry about leaving the bag on a floor. Thanks to the ClimaProof water-resistant bottom, any of the stuff that you have in your bag will remain safe, whether the bag ended up on a gym floor, wet field or something like that. The wrapped haul handles, along with adjustable, removable should strap (with padded air shoulder pad), will help you carry this bag around without even feeling it. When it comes to looks, this gym bag is simply stunning. Besides the screen-printed Adidas logo, there’s even the blank space on the end caps, with enough space for your initials or your team branding. The Under Armour started off as a footwear manufacturer in 2006, and today, they’re providing casual and sports apparel as well. This American company has been trying real hard in order to take over the world market. Even though they are not the number one manufacturer in the world, they are doing quite the good job. The quality, design and the uniqueness are something that you shouldn’t question when you’re thinking about an Under Armour product. This Undeniable Backpack/Duffel is 10 inches wide, 22 inches long and 11 inches deep. One of the greatest things about this bag is that you can use it as a Duffel bag, or as a backpack, depending on your needs and your preference. The Under Armour Storm technology delivers highly water-resistant, element-battling finish to this bag. This backpack/duffel is made out of 100% polyester, and it has plenty of room in it. These bags are perfect for carrying great amount of equipment with you. This bag is large enough for carrying your equipment, towel, and there’s even one expandable space for dirty laundry and shoes. The water bottle pocket will come in handy too, but you should keep in mind that you probably won’t be able to fit large shakers in it. This bag features adjustable HeatGear shoulder straps with sternum strap and integrated handle. 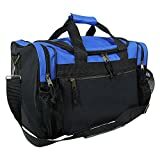 Having 2 large vented end pockets and plenty of space, along with unique design, this bag will fit you perfectly for many activities, with CrossFit being one of those. Perhaps you’ll find the design of Dalix’s products a bit different, but it’s good to stay different. They are combining the functionality and the creativity, and they keep striving for perfection. Their goals are set very clearly, and they are rushing towards their goals. Besides the creativity, the quality is something that defines Dalix’s products as well. They are manufacturing all kind of items, and amazing duffle bags are definitely one of those items. The dimensions of this Dalix Duffle bag are 17 x 9 x 9 inches. It’s made out of polyester, and there’s plenty of space in it. Keep in mind that the bag is not too large, but the usual equipment can easily be fitted into it. This bag comes with the mesh water bottle pocket, and for any kind of activity (especially CrossFit) it comes in real handy. However, you should know that the large shaker probably won’t fit into this pocket, but you won’t have any troubles with the usual water bottle. Since there are two of those pockets, the other one can easily be used as a cell phone pocket. It’s big enough, and don’t worry about losing your phone – the pocket is quite tight. Of course, this doesn’t mean that the phone will stay within the pocket in case you turn your bag upside-down. There’s a brass feet on the bottom of the bag, and there are two zipped side pockets with plenty of room in it. The closure is zippered, and this interesting and useful Dalix Duffle bag comes with shoulder strap, making it easier for carrying. Those bags make the perfect choice for any stuff-demanding activity, and especially for CrossFit. With changeable colors, adjustable straps and the ability to place your team branding on it, those gym bags can easily be personalized and become perfect for you. 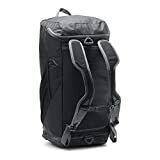 Many additional pockets along with the large compartments really make it easy for you to pack all of the required gear, including the valuables and any additional stuff. The design varies from bag to bag, from brand to brand, but the creativity will always be present. No personal favorite between those gym bags, as all of them are featuring the functionality we’re all aiming for. You can’t go wrong choosing any of those bags!